Birmingham Children’s Hospital Liver Ward 8 has thirteen new digital television sets thanks to the efforts of Kevin Harris, International Development Manager at Eaton. Kevin raised more than £7,000 in sponsorship by walking Sharp Edge in the Lake District. 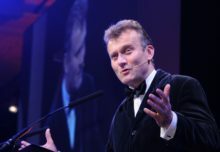 Kevin’s fundraising effort began when Eaton offered to match funds raised for charity by employees and customers as part of the Centenary celebrations for its MEM brand. MEM began business in Conybere Street, Birmingham, less than three miles from the present site in Reddings Lane. Today it is part of the international Eaton Corporation. Kevin’s original target was to raise £1,000 for the ward, where his granddaughter Freya is a patient, but support from family, friends, colleagues and customers at Eaton, together with money from the Centenary fund, exceeded all expectations. Eaton customers in Hong Kong, Kenya, Nigeria, Qatar and the United Arab Emirates, in addition to those in the United Kingdom, rose to the occasion with donations. The response meant that instead of two or three television sets, Kevin has been able to buy a set for each bed in the ward and pay for installation. The sets are 19 inch digital televisions with built-in DVD players and Free View. 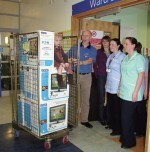 He hopes that there will even be some surplus to buy a 42 inch television and Nintendo Wii’s for the physiotherapy room. Kevin was conscious of the need for activities for the children in the long hours they spend in hospital. Freya has spent six of the last 12 months in the ward. “The staff do a fantastic job and I just hope this will help make their task easier” he says. Kevin describes Sharp Edge as “very intimidating but not particularly difficult”. It involves a quarter mile ridge walk with a 500ft drop on either side. A number of walkers have lost their lives there. This was the second time he had done the walk but since the earlier visit Kevin (58) had undergone open heart surgery. He was accompanied by his wife Iris. Eaton has set aside £50,000 in the Centenary fund and offers to match funds raised by employees and customers for charities in the fields of arts and culture, civic causes, education or health, up to £1,000 per project.